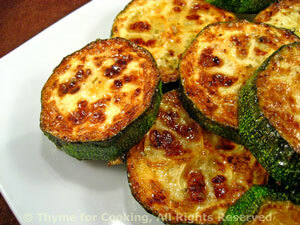 Sautéed Zucchini (Courgette), Thyme for Cooking simple summer side dish. The simplest, and one of the tastiest, ways I know how to cook zucchini. Slice the blossom end off of the zucchini, then slice it into 1/3 inch (1 cm) rounds. Don't bother with the thin, stem end. (Slice as much as you'll want to eat; I did about 12 slices. Heat the oil in a nonstick skillet over medium heat. The skillet needs to be large enough to hold all of the slices flat. Add zucchini slices and sauté 6 - 8 minutes. Check after 8 by lifting up with tongs and looking at the bottom; it should be getting brown spots on it. If not, sauté some more; if yes turn and sauté the other side. The other side won't take quite as long. Sprinkle with salt and pepper, serve.